Our range of products include robotic body wash. This car wash machine is fully automatic system. Introduce advanced technology from European, streamlined design, beautiful appearance,advanced overall performance, safe and reliable. 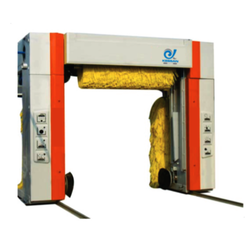 The machine use experienced brush washing technology. The complete machine is built as modular structure and transported in partly- assembled form. It is used for car, jeep, microbus and other small vans, with function of washing, waxing, drying, etc. The complete structure is painted galvanized plate and square tube, frame, avoiding corrosion and improving the corrosion and improving the corrosion resistance of the surface. Internationally renwned brands of motor and redeucer, security and stability, provide long life. PLC controlled system, depending on different models to make process of washing solution. With brush system, drying system, shapmpoo system and wax system.